AUSTIN, Texas (AP) — After years of being a late-season afterthought, Texas coach Tom Herman wanted the Longhorns to be competing for a Big 12 title in November. Texas is right where he wanted, with a key matchup against West Virginia up next. The No. 12 Mountaineers (6-1, 4-1 Big 12, No. 13 CFP) and No. 15 Longhorns (6-1, 4-1, No. 17 CFP) play Saturday in a game both need to win to keep a share of the conference lead with an eye toward the conference title game in December. It’s been a long time since Texas played meaningful football after Halloween. For three seasons under Charlie Strong and Herman’s first season in 2017, November was about trying to avoid losing seasons. This season, the Longhorns were rolling on a six-game win streak until losing last week at Oklahoma State to drop out of sole possession of first place in the Big 12. Herman said almost exactly the same thing after Texas lost its opener to Maryland. 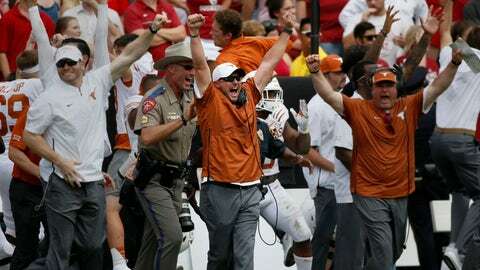 The Longhorns responded with their longest win streak in five years. The Mountaineers haven’t won a league title since joining the Big 12 in 2012. West Virginia rallied after its only loss by whipping Baylor last week. Quarterback Will Grier, who broke his finger in the first quarter against Texas last year, lit up Baylor with three touchdown passes in a game the Mountaineers led 41-0 by halftime. Those are scary numbers for a Texas secondary that was shredded by Oklahoma State and gave up 31 points in the first half. “Their energy level was high and they were striking like a firing squad,” Texas senior defensive end Charles Omenihu said of the loss. The road team has been a good bet in this series. West Virginia has won two of three meetings in Austin since 2012. Texas has said Saturday’s game is sold out. The 2012 Longhorns-Mountaineers game drew a then-school record crowd of 101,851, which is still the third-largest in school history. Holgorsen has never been one to be intimidated. A referee’s open mic in 2016 caught Holgorsen mockingly telling game officials his players were tougher than Texas. Grier has one of the biggest and best arms in college football but he’s been sloppy at times. Despite its troubles last week against Oklahoma State, the Texas secondary has been solid and able to force turnovers. Freshman safeties Caden Sterns and B.J. Foster have five interceptions between them. Texas quarterback Sam Ehlinger has 210 consecutive pass attempts without a turnover, a school record. Omenihu has six sacks and 9.5 total tackles for loss in the last four games. His job is to harass Grier or least force the quarterback to think about him on every play. “He sits in the pocket. He’s confident. I feel like we’re going to get after him,” Texas senior nose tackle Chris Nelson said of Grier. West Virginia has outscored opponents 83-27 in the first quarter, shutting out opponents four times in the opening period. Texas opponents have scored on their opening drives in six of eight games, reaching the end zone five times. The Longhorns started the game last week with several defensive starters or regulars sitting out because of rules violations and ended the game with senior defensive end Breckyn Hager drawing an personal foul penalty that was criticized by teammate. Texas players insist there’s no problem in the locker room, but that could be tested early if West Virginia jumps out big. Ehlinger’s sprained throwing shoulder seemed fully recovered last week against Oklahoma State and he even ran 10 times for 47 yards and two touchdowns. Texas needs his legs. Ehlinger had at least one run on every scoring drive last week, and punted every time he didn’t.